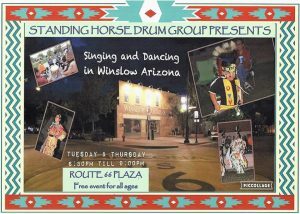 The Standing Horse Drum & Dance Group will be in Route 66 Plaza this evening. All members of the community are welcome to come watch the dances. The group will be performing every Tuesday and Thursday from 6:30 to 9 pm, weather permitting.